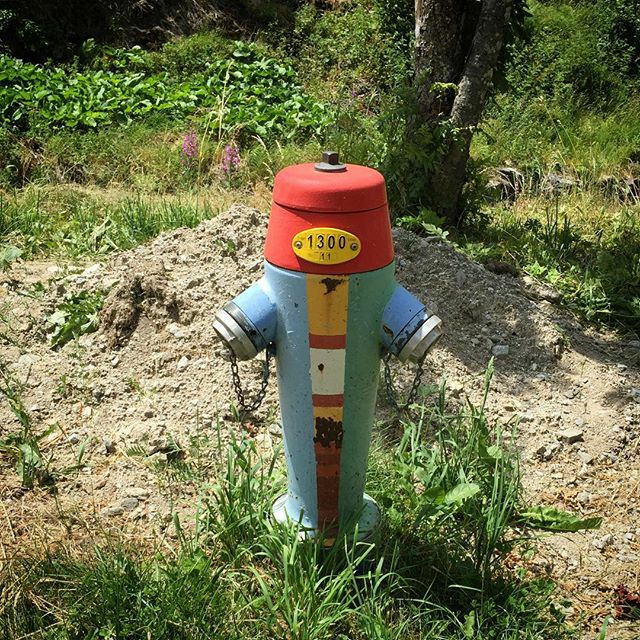 Tour du Mont Blanc — Hi, my name is Tomomi. 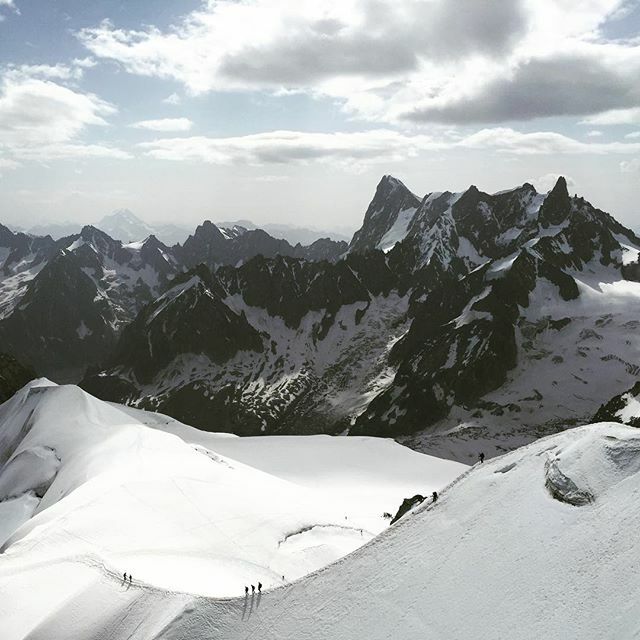 The Tour du Mont Blanc is a 170km hut-to-hut trail that loops around Mont Blanc Massif through the French, Italian and Swiss Alps. In early June, 2015, I caught a train from Paris to meet my friend Yukiko in Chamonix Valley to start our trek. Here's a quick rundown of our seven days in the mountains. The classic TMB is a 10-11 day trip, and we hacked it via aggressive walking and some public transportation. I've added references from the Cicerone book so you can use this record to tweak your own routes. Happy hiking! The plan was to meet in Les Houches around lunch, so I started the day with an early cable car up to Aiguille du Midi (3,842m) to whet my appetite. Twenty minutes on the fast-moving cars will take you higher than Mt Fuji (3,776m) and right next to the icy peaks. Absolutely incredible views. The summit of Mont Blanc nearby was shrouded by mist and clouds, which seemed appropriate. Around mid-day, we inconspicuously kicked off our adventure by taking the cable car from Télécabine Les Houches to Bellevue. It would balance out our choice to take the variante route to Les Contamines, a more demanding one that walks at almost double the altitude of the main TMB route and much closer to Glacier de Bionnassay. After a hearty breakfast of homemade croissants and peach pie, we caught a bus to Notre Dame de la Gorge to save 45 minutes of walking on city roads. From here, a short walk through a ravine brought us to the Reserve Naturelle des Contamines-Montjoie. It was an extremely hot day and the many hikers were quiet as we trudged up the bright road. Lunch was at Col du Bonhomme (2,329m), where we bypassed groups of sunbathing French hikers to share a bit of shade with some melting Americans. In the afternoon, we switched gears to walk through the snow to Col des Fours (2,665m) and then again while walking through its sunny basin, which turned out to be a treasure trove of alpine flora in full bloom. There were marmots here and there, coming out of their holes to get some sun. They whistle to warn their families when eagles fly overhead. The last hour of this long day was one of those where you see the destination in the distance but it doesn't seem to get closer. It was one worth reaching though, and Refuge de Les Mottets (1,870m) turned out to be our favorite stop along the trail. Plenty of fresh water, friendly staff, a bit of music, proper showers, and a super tasty five course meal. Amazing, right? Another glorious day! We started with an hour of uphill climbing that led to Col de la Seigne (2,516m) before reaching Rifugio Elisabetta to polish off our packed lunches. The Bonjours turned to heartier Buongiornos! 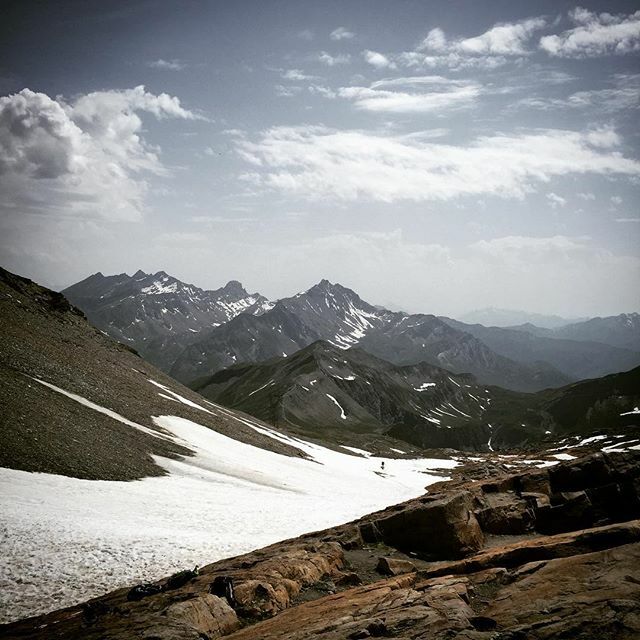 in an instant, as encounters with a steady stream of Italian day hikers coming from the other side peppered our rambling walk alongside the towering Mont Blanc massif. The weather couldn't have been better and and we enjoyed this view for hours. 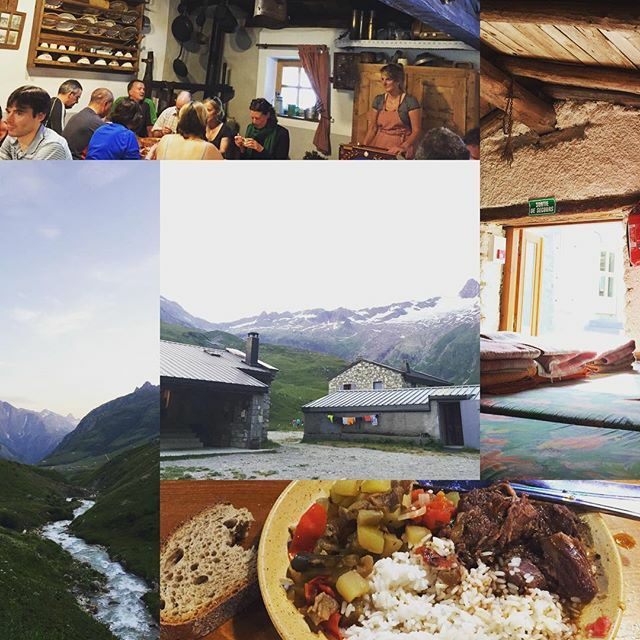 Spirits were high, and we joined a group of Irish friends down to the ski haven of Courmayer (1,224m) for the night. The road out of Courmayer back to the TMB trail winds through a residential area that makes you fantasize about owning vacation homes. Become an author, perhaps. Anyway, we blew past Rifugio Bertone and Rifugio Bonati in the morning climb, chatting with hikers from all over the world, to start our second aggressive hike through Italy. Clouds covered the peaks to our left and we congratulated our good fortune for the views of the previous day. Not that this day didn't bring an equally enjoyable time. At Rifugio Elena, we could look back at the valley that we'd spent the day traversing. Much of it was visible in our line of sight, and it was a special moment to realize that what had been the path ahead had become the path that was walked. This was the day in which we would make the most shortcuts, and we left Refugio Elena at 6am in case we missed a connection during the chain of bus-train-bus hopping. After a quiet uphill climb and breakfast on the road, we walked into Switzerland around 8am and caught the first bus in Ferret around 10:30. The mountain scenery from the bus and train windows was really lovely. Lunch was in the town of Martigny, where we followed our stomachs to a Chinese restaurant. So good. The commune of Trient was blistering hot when we arrived at Auberge du Mont Blanc around 3pm, and it felt luxurious to chill in a room without 40 other people, knowing that our "work" for the day was done. I showered, checked Facebook, and then Wikipedia to learn the difference between a commune and a town. Dinner was tomato fondue over boiled potatoes (lunch = good call), while chatting with a Belgian family. Most people wandered out after dinner to check out the pink church and the trails for the next day. The weather forecast showed thunderstorms throughout the day but our fellow trekkers seemed unconcerned. They turned out to be right, as it didn't rain on our route at all! A planned night at the nearby Tre-le-champ turned into a pitstop for lunch, and we cheerfully continued up to Lac Blanc. 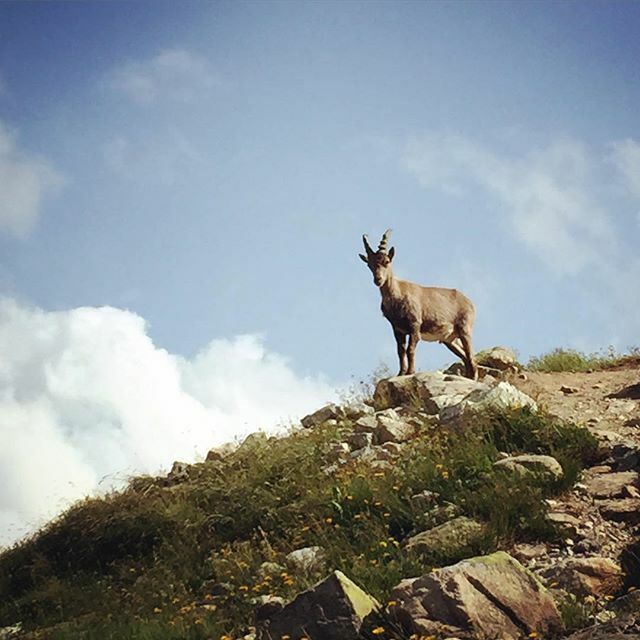 It was a fun climb that included scampering up metal ladders and saying hello to the ibex that strutted up and down the trails. Our luck ran out when we discovered that the 30-person Le Refuge du Lac Blanc was full. Of course, the only time we hadn't made a reservation. But Refuge de La Flégère was a mere two hour downhill climb away, and we arrived just in time for the 7pm dinner. After a 10hr trek for what had originally been a 3hr day, I was running on empty and could barely sit through the meal of pasta salad, potato gratin, and mousse du chocolat. Add to that the soothing familiarity of being back in Chamonix Valley, and I conked out around 9pm. We woke to delicate morning lights paying tag on an incredibly clear view of the mountain range. Even the staff marveled at the sight, and the refuge was filled with good cheer as everyone wished each other well on their journeys. Ours took us along the ridge of Aiguilles Rouges, alongside many trail runners and day hikers. There were plenty of roads and cable cars (and paragliders!) down to the town of Chamonix but after a long lunch at Altitude 2000, we decided we weren't quite ready to head down. 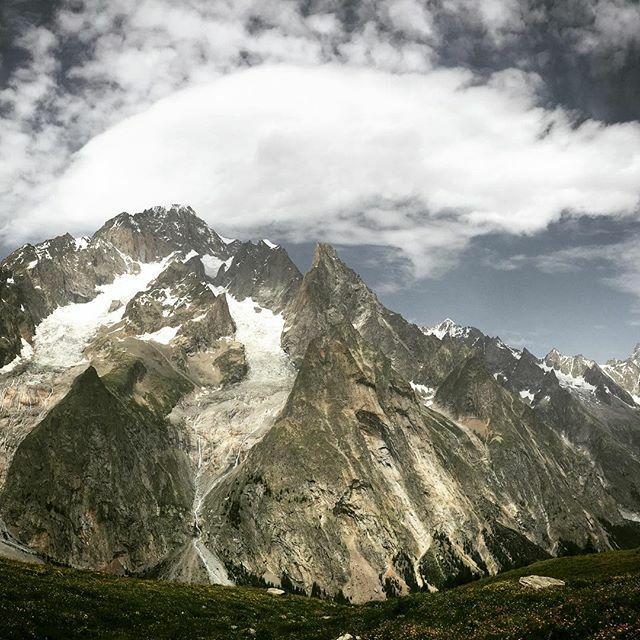 We peaked Le Brévent (2,525m) to have one last look at the Mont Blanc massif - a hike that included an unexpected panoramic view of Reserve Naturelle de Passy on the other side of Aiguilles Rouges - before a long climb down to town. I want to end with these words from John Muir: "The mountains are calling and I must go". I recently learned that it's only the first half of a sentence. The full quote, from a letter to his sister in 1873, is "The mountains are calling and I must go, and I will work on while I can, studying incessantly. ", in reference to his preservation work. The power of the mountains lie in its ability to incur this kind of commitment on top of this primal pull. Many thanks to the level-headed Yukiko, who set the pace and got us home! I walked Tour du Mont Blanc with a base pack weight of 4.6kg in a 30L backpack. The recommended range is 8-10kg but for a small Asian female, this was probably the right weight!